Over $50,000 has been distributed in SPIRIT REFERRALS to date! What are you waiting for? Refer a friend to any future event and you both receive $100! It’s our amazing loyalty referral program. We believe SPIRIT encompasses our core values – community, excellence, integrity, passion, teamwork, creativity, and innovation. What’s more, SPIRIT reflects our love for helping others, such as our amazingly successful Turn It Up Foundation, providing funding to deaf and hard of hearing children for musical pursuits. To learn more about our 2019 CME Conferences, read our FAQs. How can I benefit from SPIRIT? Simple. For every person who registers using your SPIRIT code, you both receive $100! It’s really so easy – think how many providers you know – whether at your current work place, prior practices, friends, colleagues, and even former classmates – this is the PERFECT opportunity for a class reunion! Checks to you and the people registered with your code will be mailed 2 weeks following the event. Code must be entered at time of actual registration to qualify. One SPIRIT code use per household. Rewards add up quick. Plus, for our Skin, Bones, Hearts & Private Parts 2019 CME cruise, you’ll receive 50% off the conference course fees. Learn about our SPIRIT Referral posting policy. We’ve made it easy for you! Get started here. How do I get my SPIRIT code? If you’ve attended our events before, the code is typically on your name badge and other materials. 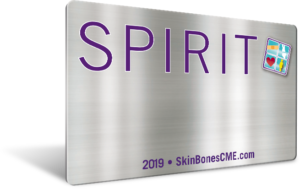 And each January, all attendees of Skin, Bones, Hearts & Private Parts programs receive a personalized SPIRIT card/key tag in the mail. If you don’t remember your code or would like to request one, please e-mail info@dmgcme.com. Did you really give away $50,000 in SPIRIT Referrals in 2018? Absolutely! Read the stories below and see how easy it is! “For me, it was simple. I told my friends at work how amazing the Skin, Bones, Hearts & Private Parts programs are. I encouraged them to check one out, and I shared my SPIRIT code with them. I told them not only would they really enjoy and benefit from the CME and overall experience, but that both of us would earn $100. A few days went by, and they asked for my SPIRIT code again when registering because they had lost it. I fully believe in the Skin, Bones, Hearts & Private Parts programs and always learn so much when I attend which is why I keep coming back. I particularly love listening to two of the speakers, John Bielinski and Wendy Wright. I could listen to them 8 hours a day for 4 days straight or more. “After attending my first conference in San Antonio 2015, I knew I had to share the excitement and gained knowledge I endured after the conference. Before boarding my plane to Georgia, I texted each of my NP and PA contacts to tell them I finally found a clinical, evidenced-based conference that kept my attention. I had attended several other National known conferences where I would lose focus after a few hours of legislature talks, but this conference was different. In fact, I enjoyed having my peers present information that was useful in practice. Once my friends, colleagues, and their friends heard my testimony, they wanted to see for themselves. The most reward for each of us is to have a reduction in registration from my referrals. Another positive is early start and finish times so we can tour the city. “I am a Family Nurse Practitioner, currently working at a retail health clinic. I live in North Myrtle Beach, SC, with my husband and two dogs. I graduated from Francis Marion University in Florence, SC. Since I am practicing at my first job as a nurse practitioner, I was eager to find an interesting and applicable course for my continuing education requirements. I first heard about Skin, Bones, Hearts, and Private Parts from a colleague, who had nothing but wonderful things to say. After participating in one of these courses on my own at the Myrtle Beach location, I was beyond impressed. The content of the courses covered a wide range of material that is both relevant to practice and interesting. The speakers were very knowledgeable and engaging. The entire process was well organized, and the staff members were very friendly and approachable. They even gave out tumblers and flash drives to all of the guests! Another very neat aspect is the Spirit Referral Program. Not only do you get education, CEU credits (a very large amount I must add), and a pleasant experience overall, but you ALSO have the option to earn money in the process. It is so simple; you refer someone, and each of you get rewarded for it ($100 cash!). The person you are referring just has to use your code when they register. It is extremely easy! “When I started my career as a nurse practitioner, I was somewhat clueless as to how I wanted to obtain my continuing education hours. I remember going online to search “nurse practitioner continuing education” and coming across an endless amount of conferences, online courses, and modules. How could I possibly decide from all of the options out there? Then one day I was talking to a nurse practitioner friend of mine who mentioned the Skin, Bones, Hearts, & Private Parts conference.